Researcher teaching patient to walk again, using KineAssist. The harness moves with her, unless she loses balance, then the harness catches her before she can fall. HDT robotics engineers, along with researchers at the Rehabilitation Institute of Chicago and Northwestern University, have worked to create a completely new type of therapy system for gait and balance recovery. HDT’s KineAssist-MX (Mobility eXtreme), provides clinicians with evidence-based tools and treatment guidelines to get patients back into the community, moving with greater confidence and more capability than can be achieved using other therapy approaches. This patient is practicing standing up from a seated position. If he loses his balance, the KineAssist-MX will immediately sense his difficulty and catch him, before he can fall. All of this happens so quickly that the patient is caught before he drops three inches. Each year, hundreds of thousands of people enter inpatient, outpatient or skilled nursing centers with gait and balance problems due to a number of conditions. Often, the required safety measures in these facilities have the unintended effect of slowing recovery because it is necessary to stop people from attempting radically different movement patterns that may result in a loss of balance or a fall. Over the years, researchers have learned that challenge-based activities that allow people to make mistakes and learn from them can help those people to reach higher goals in less time. The KineAssist-MX™ is a platform that allows a person undergoing recovery of walking and balance ability, to make critical mistakes that result in deeper understanding of how to move better within a completely safe and controlled learning environment. Unlike other therapy treadmill devices, the KineAssist is an “activity center” that is 100% user intent-driven. Very sophisticated sensors on the device “feel” when the person intends to walk, and will move at exactly the speed desired. This, combined with the completely comfortable body-weight support mechanism, allows people to practice a wide variety of exercises and skills that simulate real-world activities while safely catching them during any unintended loss of balance. Knowing that the device is completely safe, people are more comfortable during practice with very challenging activities and will work harder and faster to improve their performance. New research and clinical practice are emphasizing, for people recovering walking and balance, more direct involvement and intent-driven exercise regimens to stimulate a more intense and active therapy session, where the person is safely allowed to experience critical mistakes and learn from them. After brain injury or disease, a person needs to regain the capability to control their own body movements. Ideally, these new movement patterns are linked directly to goal-driven tasks that match real-world situations. Given the individualized nature of neural disorders, each person must discover, with the help of skillful clinicians, the best way to control their own movements. Self-driven robotics affords an individual to try different tasks and learn, without fear of bodily harm, whether the task results in success or failure. With success, the individual has discovered a new and improved way to accomplish a meaningful task. With failure, the individual is driven to try new approaches to movement control that can eventually result in success. New research has demonstrated that individuals post-stroke are able to achieve high-levels of success with challenging tasks within a five minute period or even less, and that this success results in new movement patterns that are sustained from week to week. Who is appropriate for therapy? What are the size limits for the KineAssist? What if the individual uses a cane or walker? People can train on the KineAssist-MX with a cane, crutches, or walker, although therapists might encourage them to try to walk without them. What happens during a loss of balance? The KineAssist-MX is designed to detect when a loss of balance occurs and then catch a person after a drop of more than three inches (this amount can be adjusted). After the drop and catch, people can right themselves, or the therapists can assists them in standing using the lift support mechanism. Patients can safely practice a wide variety of mobility exercises. The KineAssist-MX is an assessment and training tool that is appropriate for Inpatient Rehabilitation Hospitals, Skilled Nursing Facilities and Assisted Living Centers where physical rehabilitation is performed. The challenge-based activities that the KineAssist® facilitates have been researched for a decade and have been validated in numerous articles, posters and case-studies. 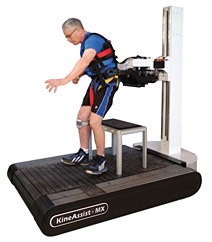 The KineAssist-MX is a stand-alone, patient-driven activity platform that facilitates a large number of therapeutic exercises in a single location. The patented collaborative-robotic configuration allows patients and clinicians to physically interact during the training activities. Unlike other support devices such as overhead tracks, the KineAssist requires no infrastructure change and can be moved, if needed. After neural injury or disease, a person needs to regain the capability to control their own body movements. Ideally, these new movement patterns are linked directly to goal-driven tasks that match real-world situations. Given the individualized nature of neural disorders, each person must discover, with the help of skillful clinicians, the best way to control their own movements. Patient-driven robotics affords an individual to try different tasks and learn, without fear of bodily harm, whether the task results in success or not. With success, the individual has discovered a new and improved way to accomplish a meaningful task. When success has not yet been achieved, the individual is driven to try new approaches to movement control that can eventually result in success. New research has demonstrated that individuals post-stroke are able to achieve high-levels of success with challenging tasks within a five minute or less period, and that this success results in new movement patterns that are sustained from week to week. Who Are Our Clinical Partners? For the last decade, HDT has worked with some of the most advanced rehabilitations centers and universities for the continued development and refinement of the KineAssist-MX. Over the past decade, researchers have been exploring novel ways to enhance therapy by developing exercise programs that challenge patients to reach beyond their abilities while working in a safe environment. In addition, new research and clinical practice are emphasizing more direct patient involvement and intent-driven exercise regimens to stimulate a more intense and active therapy session, where the patient is safely allowed to experience mishaps and learn from them. The results of this work led to the development of the KineAssist-MX and the wide variety of exercises that can be safely performed on it. The KineAssist research was conducted in collaboration with the Rehabilitation Institute of Chicago, Northwestern University, with ongoing projects at the University of Alabama, Birmingham. Capo-Lugo C, Mullens, C, Brown DA: Maximum walking speeds obtained using treadmill and overground robot system in persons with post-stroke hemiplegia. J. Neuroeng Rehabil. 2012 Oct 11;9:80. doi: 10.1186/1743-0003-9-80. Burgess JK, Weibel GC, Brown DA: Overground walking speed changes when subjected to body weight support conditions for nonimpaired and post stroke individuals. J Neural Engr Rehab 7:6, 2010. PMID: 20149244. Patton J, Lewis E, Crombie G, Peshkin M, Colgate E, Santos J, Makhlin A, and Brown DA: A novel robotic device to enhance balance and mobility training post-stroke. Topics in Stroke Rehabilitation 15.2: 131-9. 2008. Hidler, J. and Brown, DA: Robotic Devices for Overground Gait and Balance Training in Neurorehabilitation Technology by Dietz, Volker; Nef, Tobias; Rymer, William Zev (Eds. ), Springer, 2012. Breger, J, Collins N, Deshpande A, Johnston L, LeJeune J, Palit P, Potter K, Hedman L, Brown DA: Validity of the K-9 & BESTest balance measures in community-dwelling stroke survivors. 2012 Combined Sections Meeting of the APTA, Chicago, IL. Capo-Lugo CE, Mullens C, Brown DA: Maximum walking speeds obtained using treadmill and overground robotic system in persons with post-stroke hemiplegia. 2012 Combined Sections Meeting of the APTA, Chicago, IL. Anand I, Bell S, Kerzee-Stames A, Logan, J, Schmidt K, Brown DA: Individuals post-stroke walk faster with body weight support on a challenging, compliant surface. 2011 Combined Sections Meeting of the APTA, New Orleans, LA. Foster LW, Goodlow K, Brown DA, Lewis E, Roth E, McKenna V, Alexander A, Berkowitz M: Gait and balance training in stroke subjects utilizing the KineAssist®. 2011 Combined Sections Meeting of the APTA, New Orleans, LA. Burgess JK, , Brown DA: Variations in loading type cause timing changes in paretic leg extensor muscles during pedaling. 2010 Neuroscience Meeting Planner. San Diego, CA: Society for Neuroscience, 2010. Online. Bartloff J, Bitting J, Lueke A, Sbertoli C, Sofen L, Walsh J, Johnston C, Hilliard MJ, Brown DA: After effects of slow isokinetic walk speed training on self-selected gait velocity in person with chronic post-stroke hemiparesis. 2010 Combined Sections Meeting of the APTA, San Diego, CA. Foster LW, Goodlow K, Lewis E, Roth E, Brown DA: Gait and balance training with KineAssist. 2010 Combined Sections Meeting of the APTA, San Diego, CA. Patton J, Brown DA, Peshkin M, Santos-Munné JJ, Makhlin A, Lewis E, Colgate JE, Schwandt D: KineAssist: Design and Development of a Robotic Overground Gait and Balance Therapy Device. Topics in Stroke Rehabilitation, 2008, Mar-Apr. doi: 10.1310/tsr1502-131. Díaz I, Gil JJ, and Sánchez E: Lower-Limb Robotic Rehabilitation: Literature Review and Challenges. Journal of Robotics. 2011. doi: 10.1155/2011/759764. You can see videos of the KineAssist-MX in action on our video page. Woodway, Inc, is the exclusive, worldwide distributor of HDT’s KineAssist-MX.